My garden blog buddy Jordan of Metropolitan Gardens (check out his incredible blog if you haven’t already) said the other day that he noticed Greenwalks has been “in a bit of a lull” lately. 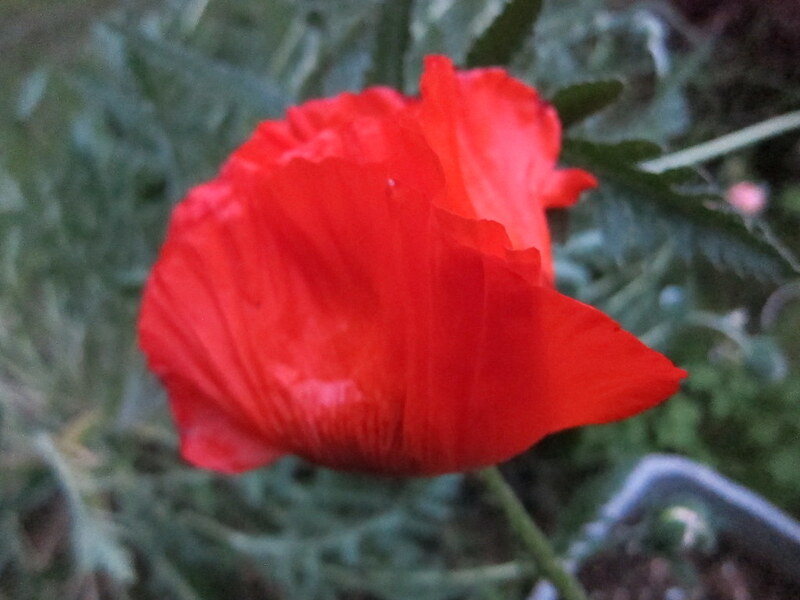 That was a rather kind way, I thought, to point out the obvious, which is that I had basically abandoned it, and indeed all of garden blogland, since the end of last spring. Why did I stop? Many reasons: life challenges, lack of time, feeling like I had nothing novel or of interest to say or show, the usual. Did I miss it? Yep. Did I feel bad for just trailing off without explanation? Kind of. But here’s the weird thing – after two years (okay, not quite) of frequent posts and obsessive tagging, a ghost trail of Greenwalks still exists out there in Web land and the clicks didn’t completely stop. I did miss the comments and the nice exchanges with fellow bloggers, though, and maybe there will be a time when I am able to come back to this world more regularly, since it has been so fun to be a part of. In the meantime, Greenwalks will probably stay in its unofficial lull. I hope to be back eventually, but for now will leave you with the last images I uploaded to my Flickr account at the end of summer – a bit of warmth on a day where snowflakes are floating down from the Seattle skies. Cheers and Happy New Year to all, and may your gardens grow well this coming year! 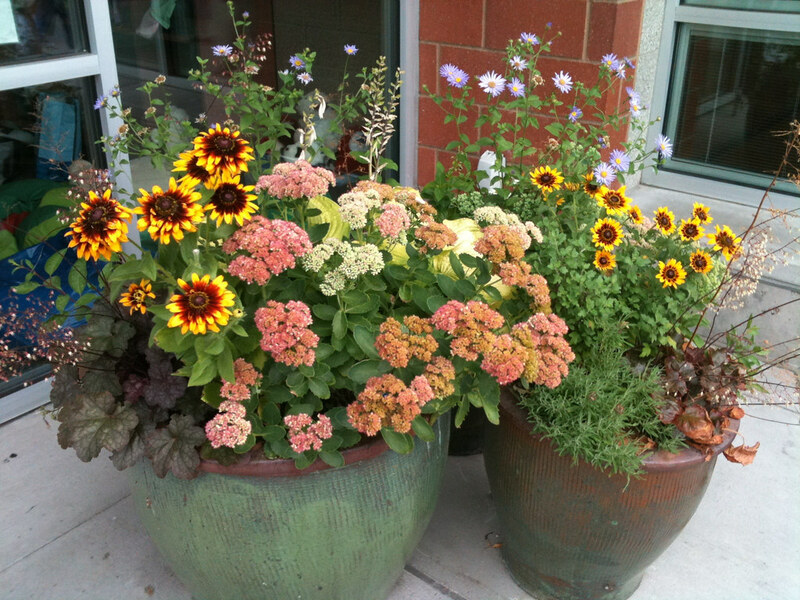 Well-composed planters outside the Northgate Community Center. Lots of kids zipping around the next-door playground, but the pottery and flowers are intact. Miraculous! 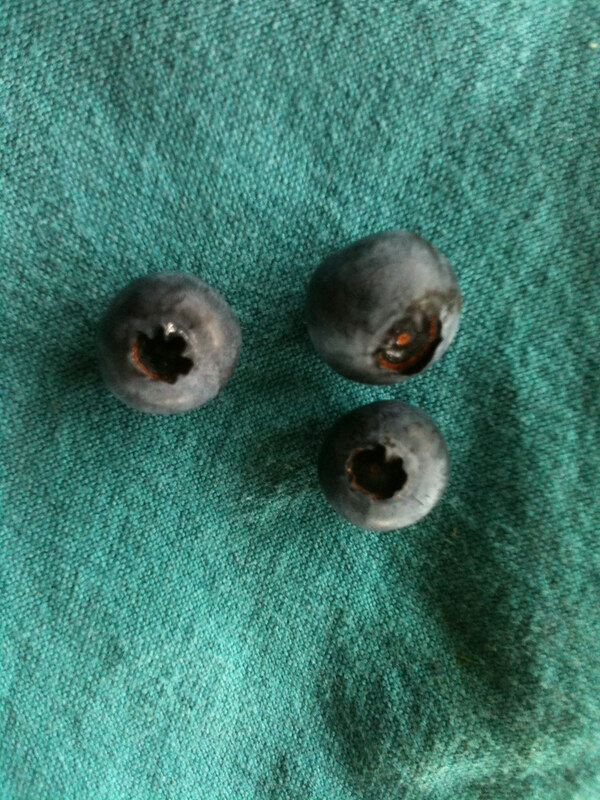 Sum total of our blueberry harvest this year. I moved the bushes to a sunnier spot, so maybe next year we’ll get a few more?!?! 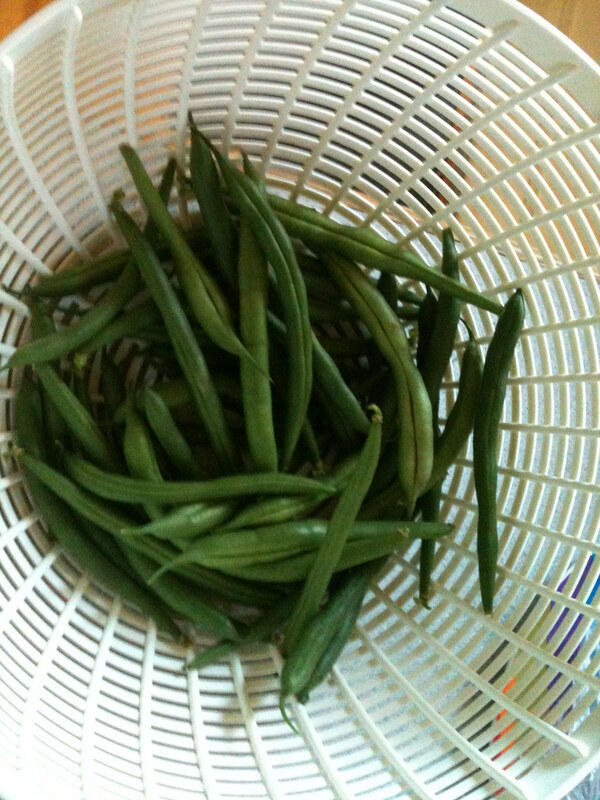 The green beans are reliable performers in our small veggie garden. We enjoyed these within about 10 minutes of picking them! 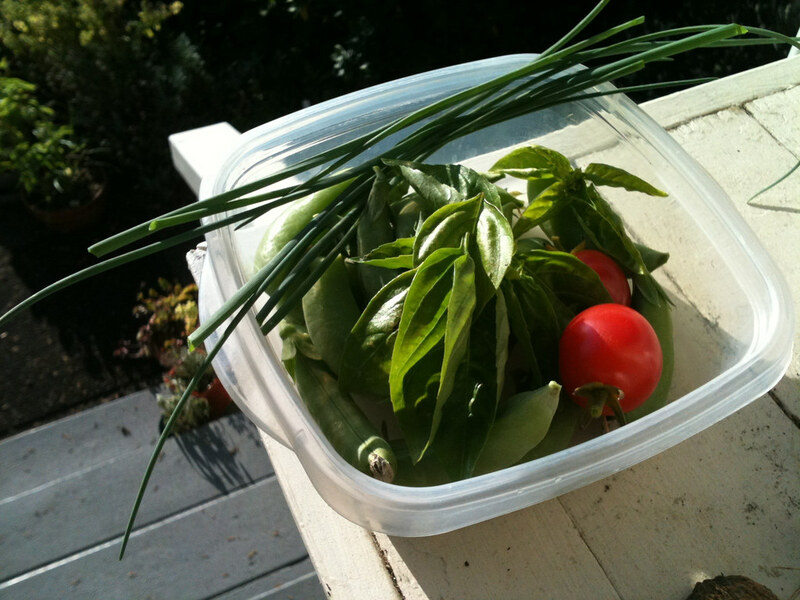 Our harvests will never tip the scales, but it’s nice to have a little something fresh every day from the garden. The end of the snap peas (planted super late, but then a bumper crop since the summer was cool), some cherry tomatoes, basil (rescued from the jr. gardener, who usually eats every leaf before I can snip any!) and chives for three-onion risotto. Last but not least, my favorite volunteer Mexican sunflower of the summer. I haven’t planted these for years, they just keep coming up in my parking strip veggie patch! Every year, the colors are slightly different. I wonder what colors will show their faces this coming year? My spindly parking strip ornamental crabapple trees, which I keep threatening to remove but somehow never do, just did the strangest thing. Perhaps distracted by the recent and unusual-for-August spate of cool, wet weather, they put out a new bunch of leaves and, even odder, some more blossoms. As far as I know, they have never done this before, and both trees are at it. Has anyone else experienced this? Am I wrong to find it bizarre?? I’m not complaining – they look a little less terrible this way. Just puzzled. 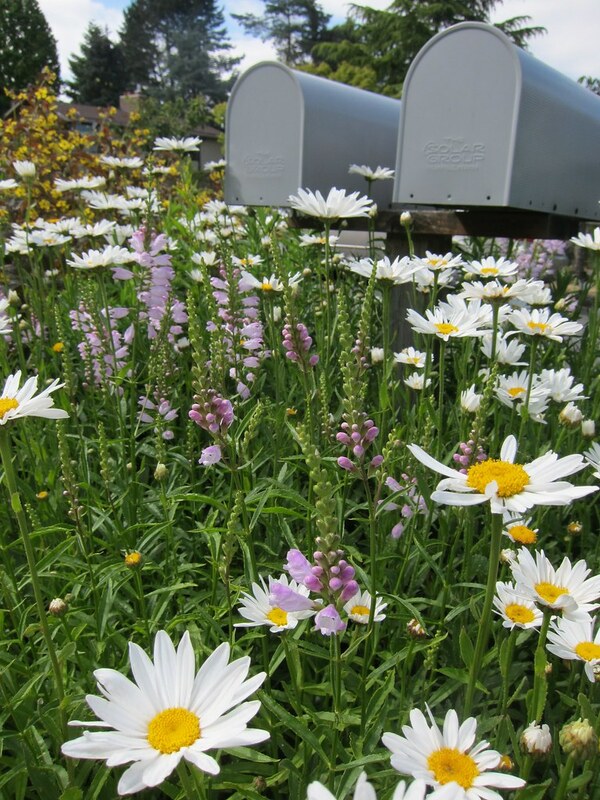 A parking strip garden in the Meadowbrook neighborhood of Seattle showed off some great possibilities for that somewhat prosaic and often weedy member of the plant kingdom, the daisy. 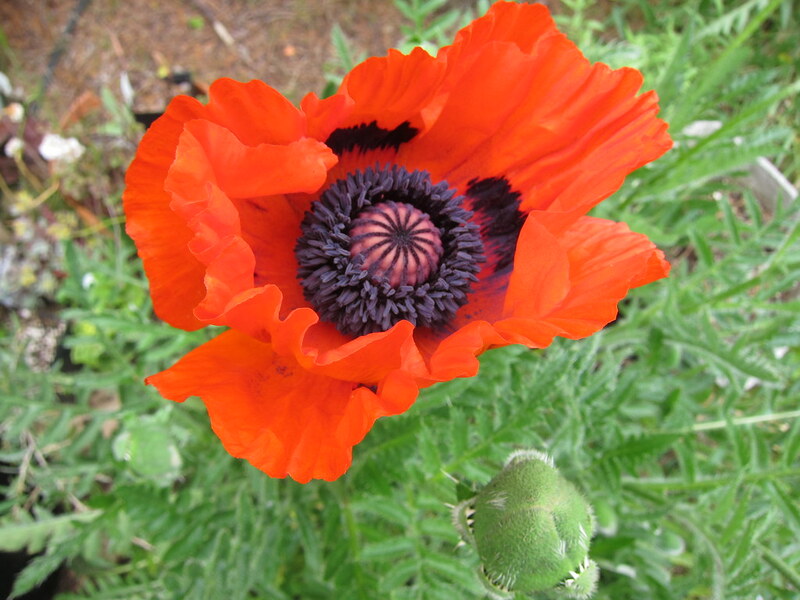 I have these in my own garden, in clumps and singles, mostly I think as a self-sower that came over from the neighbors’ to the north. 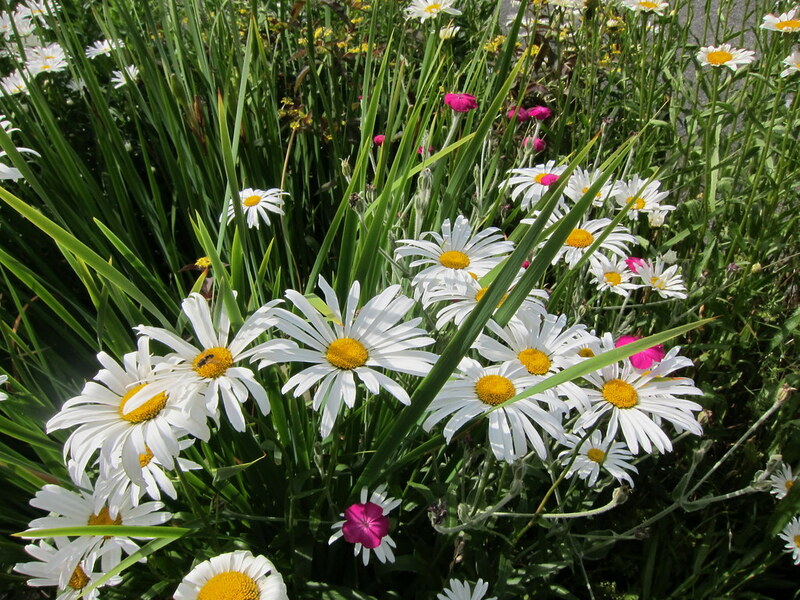 (After having mis-named them twice, I now think they are the Shasta daisy hybridized by Luther Burbank – see what you think, more info here.) I like them okay but they would probably be better if I paired them intelligently with other plants, as this gardener has. 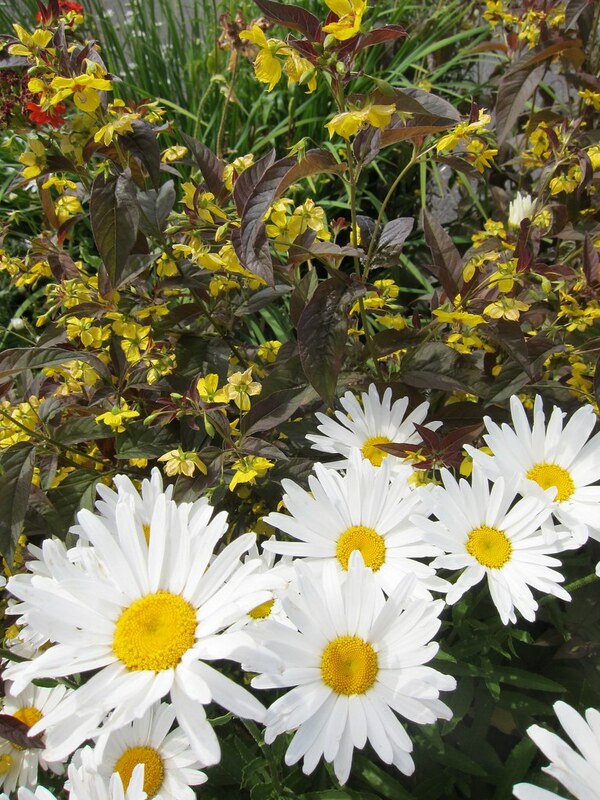 Picking up the daisy center with the bright lemon flowers and bronze foliage of Lysimachia ciliata ‘Firecracker’? Brilliant. Letting them snake in a line through iris foliage and hot pink lychnis? Genius. But my favorite – achieving the ultimate country-in-the-city look of a tall meadow while simultaneously covering up the mailbox post: divine! Do your neighbors garden? If so, do you share plants with them? I have found that I often have plants to spare, nothing too special, but if someone asks about it and I have extras, I try to pot up a few and bring them over. Since I have so many self-sowers in my wild and currently quite unkempt garden, folks are actually doing me a favor by taking some of the spreaders off my hands. Recent donations have included Erigeron and lavender, as well as some leftover tomatoes from my mom’s seed-grown stash. Trading plants with other gardeners is one of the things I most enjoy about gardening, even though I have probably received far more than I have given! I’ll just have to keep trying to catch up. 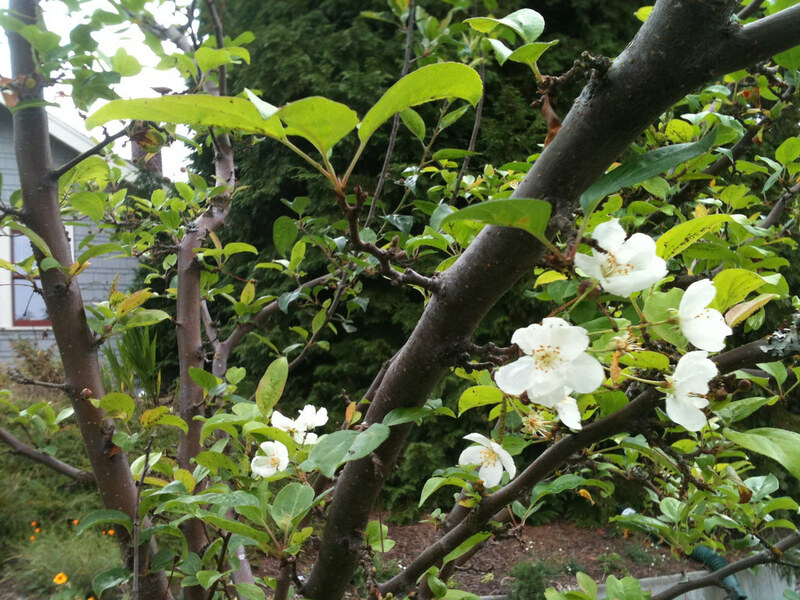 The berry crops in the Pacific Northwest have suffered a lot from the cool, wet spring. What is merely annoying for the home gardener has been devastating for farmers. Every week, at the Farmers’ Market we frequent, we keep hearing sadder and sorrier tales. Cherry crops have been hit hard too, as well as many grains. 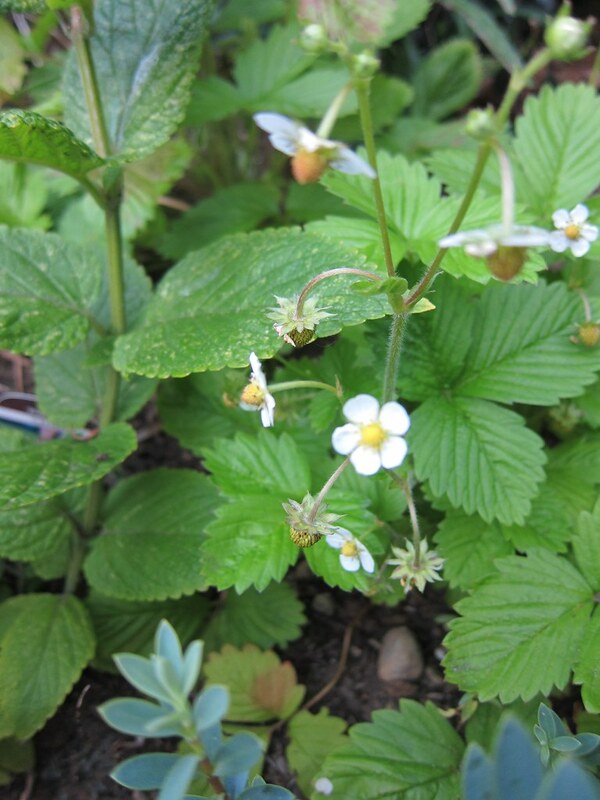 I’m not much good at growing fruit, but have always enjoyed having a few alpine strawberry plants scattered around the garden. I usually let my daughter harvest and eat the tiny berries as she finds the ripe ones – they never even make it into the house. The haul was pretty pitiful this year, but there are more on the way now that the sun is (sometimes) out. I love seeing those bright white blossoms, knowing that they will be transformed in a short while into a treat for my girl. 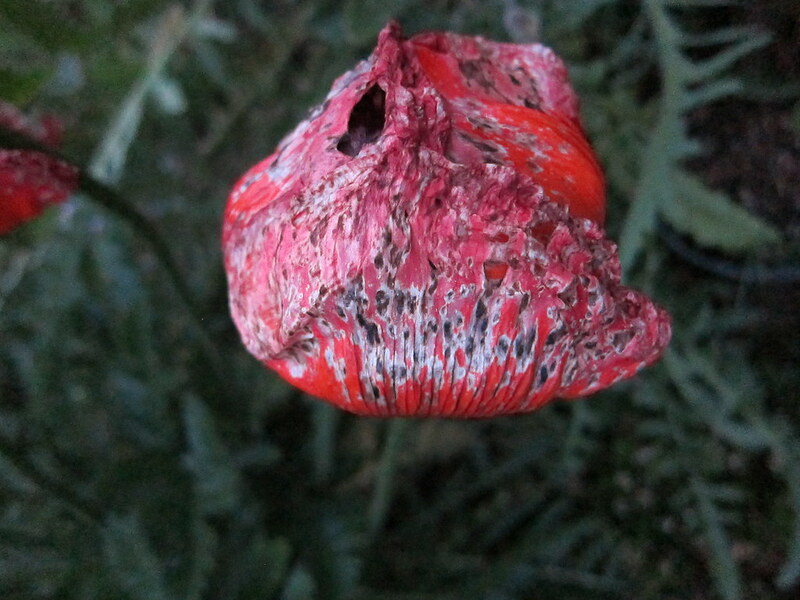 The birds have mostly left them alone, even though some are planted near our birdbath. This shot is semi-blurry since it was evening when I took it, but you can see the flowers actually morphing into berries. Do you grow berries? Are you getting to eat any this year? That’s the speed of my blogging, blog reading, and gardening this summer. Or slower. More like a wet bee, one of which I found on some lavender I cut and brought inside in the rain last week. 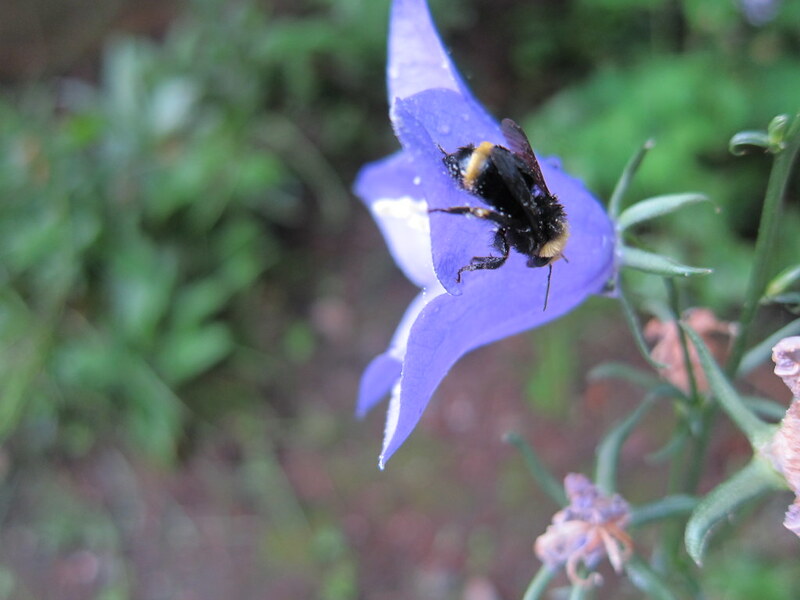 Luckily, I have not been stung too frequently in my life, so it wasn’t a big deal to let the bee crawl on my finger so I could take it outside to transfer it to a flower (Campanula persificolia) for some drying-out time. It didn’t sting me, and when I went back later to check, it had gone, so I hope it was able to fly away. The rains have gone, the sun is here, the garden is taking care of itself by necessity and if I can water every couple of days, usually as the sun is setting after 9:30pm, that’s life in the big city. How is your garden growing so far? Do you have time to actually enjoy it? I hope you do! I feel like I should rename this endeavor Failblog. Oh wait, already taken! This is probably the longest stretch I have gone without posting since starting Greenwalks in 8/09. Sorry to those who came here daily, at least for a while, in search of something new! 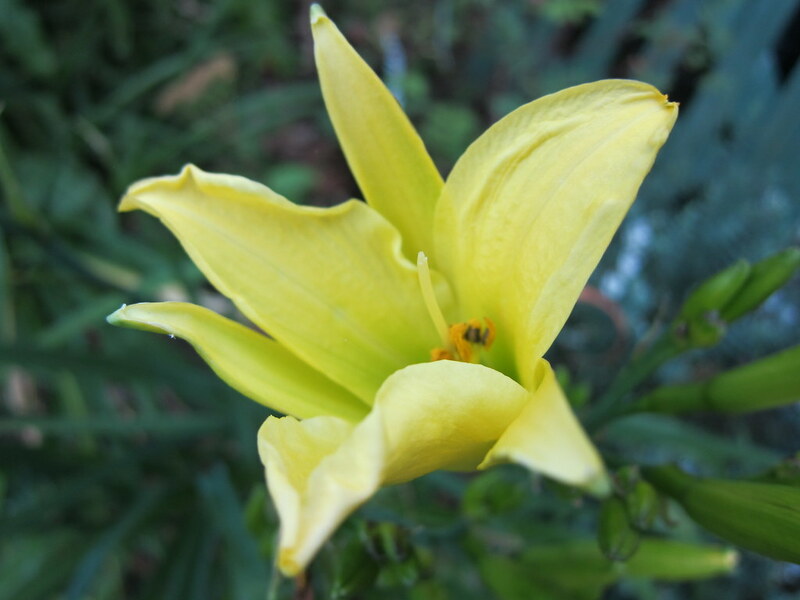 And also sorry that I have not been around to visit folks and see what everyone’s gardens have been doing. I’m sure it all looks splendid! 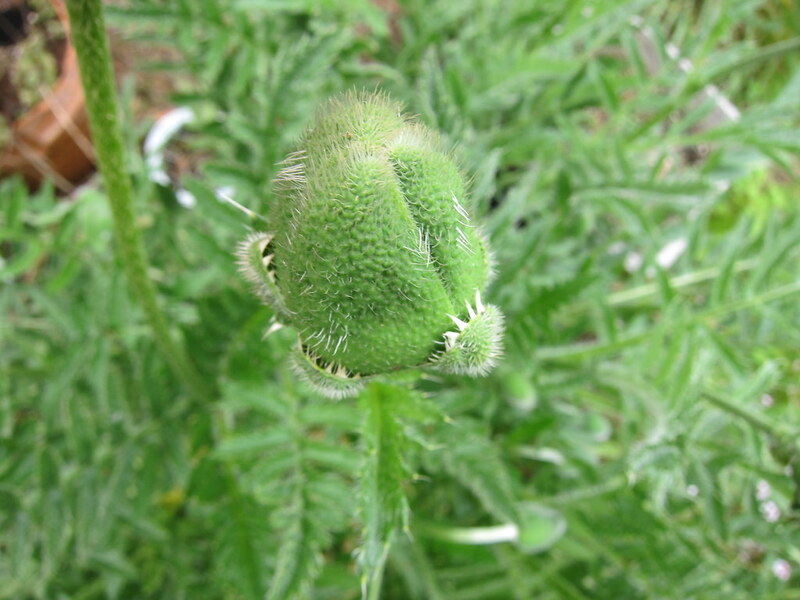 While I have been rushing off to end-of-school functions, music rehearsals, and other non-gardening-related pursuits, perennials and self-seeding annuals have been keeping the garden moving despite my neglect. 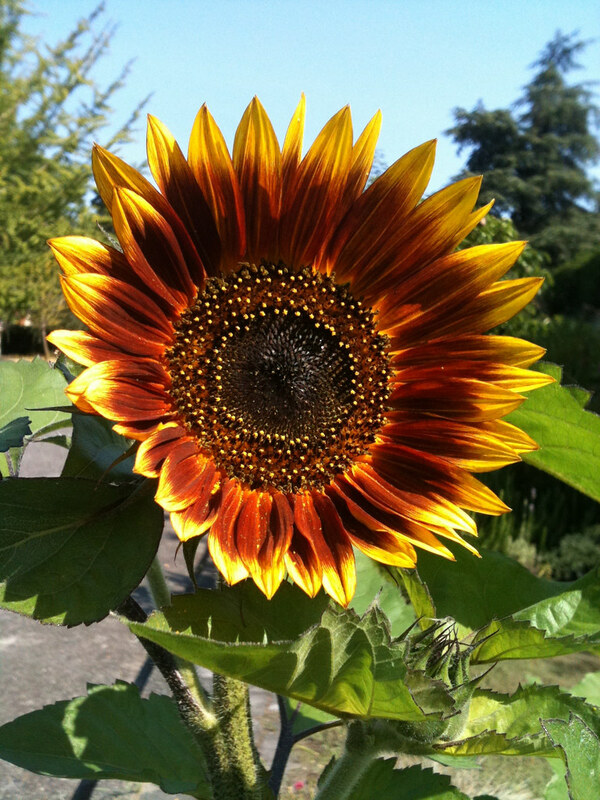 We had the rainiest first few weeks of June in history, which was a bummer for planned outdoor events and Seattle’s general mood, but good for the gardener with no time to water! 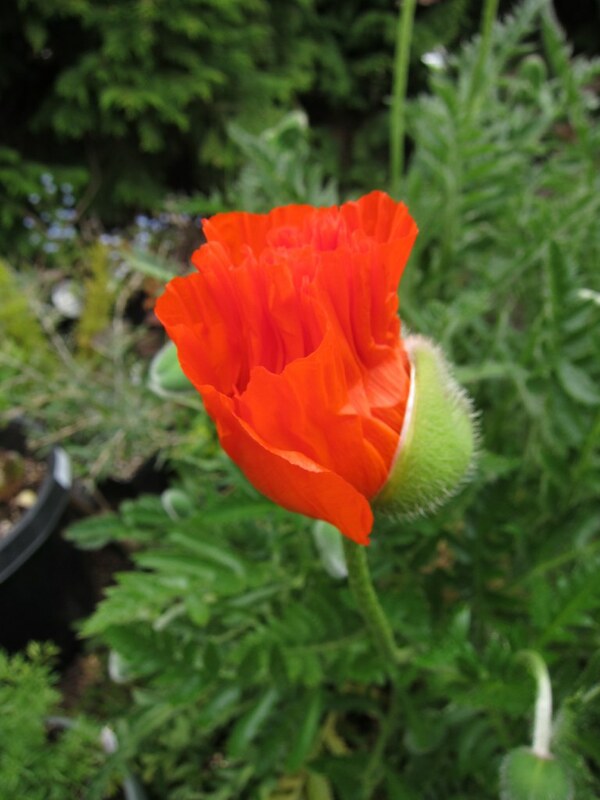 The Oriental poppies (Papaver orientale) that were already planted in a tough spot here when we arrived five years ago (next to a cedar tree with challenging surface roots – nothing else will grow there) continue to flourish. 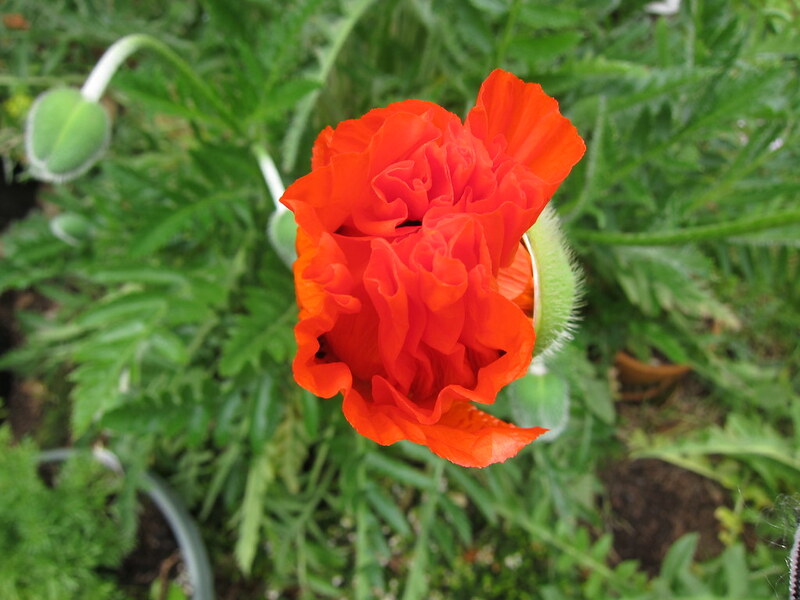 The orangey-red ones always seem to open first, followed by the pale pink, and then the coral ones, which are still to come. Butterflies don’t live very long. 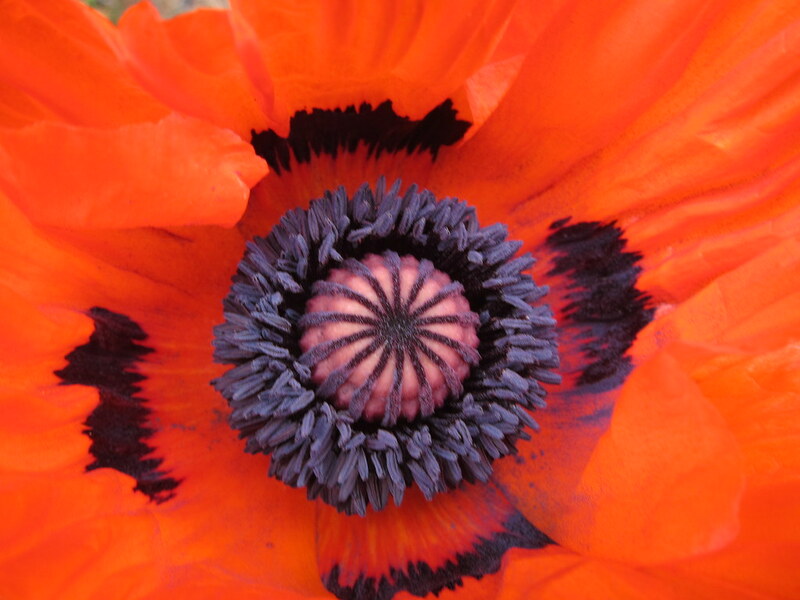 Neither do poppies. But while they last, what magnificence!